Explore the Virgin Islands in a historic schooner with modern comforts. Enjoy swimming, windsurfing and snorkeling in crystal-clear waters. Choose from three-, four- or seven-day tours to picturesque islands. Travel picture of The billowing sails of Sir Francis Drake. We cruised on the Sir Francis Drake out of Tortola in 1991 & have wanted to do a like cruise again. Is the Sir Francis Drake still sailing/ How do contact them. 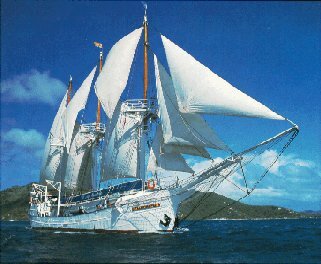 We sailed on the Sir Frances Drake out of Antigua in June 1996. Best trip ever! Would love to do again! Any info? Sorry to report, but the ‘Sir Francis Drake’ was lost during Hurricane Lenny in mid-November 1999. We would love to sail again on a similar cruise like the SIR FRANCIS DRAKE was. Do you have any suggestion out of St. Thomas by End of October 2010? Just saw picture of what looks like a replacement sailing ship for the earlier one. Can you send more information about cruising on the replacement? When and from where does it sail? What are the ports of call? Most important: can passengers still get off to dance at beach bars? i worked on the drake in 1990/1991. frank was a good and able captain. brian on the other was a pompus, idiotic twit. he ran her aground taking a ‘shortcut’ north of water island at st. thomas. he was a cruel racist, that almost killed me when he refused to let me off the boat for 8 days. i had a fever of 104 and dysentary. i was able to get medical help at st. john and stayed with a friend till i was well enough to return to the ship. he tried to cheat me out of my wages and said if i was “one of them niggers, he would have thrown me overboard”. i then quit and he tried to get me to stay. i repaired all of his electronics and his electrical damage in the engine room, which was damaged when he ran the ‘drake’ aground. the fire hoses were unusable, the lines were corroded shut. the bilge pump was a joke, i had to bang on the valves to make it work. it supplied raw water to the top side toilets and the fire hoses, but to empty the bilge twice a day, i had to use the same pump. it was a dissaster waiting to happen. still i enjoyed the ship, it had a good crew…except for blye, i mean brian. the whole crew hated him. let me guess, who was in command when she went to davy jones locker, BRIAN? I worked as the bartender on that ship stephen,do you remember me? Great Times. Daryl worked as deckhand and Steve was a bartender. I remember Claire, Captain Frank and Brian. and I cam across this post and really brings back so many memories. That year we sailed out of Antigua north up through St Bart’s St Kitts finished a week later in St Martin. I was hooked. Even got to sail around Manhattan when she came up for the 500th anniversary of Columbus voyage to America in summer of 1992. But I truly cried when I was called by the ladies who handled the bookings in Aurora Co. to tell me how it sank. It was located about 10 miles SSE of St Marrteen in about 1200 ft of water. So sad, I TO this day can’t believe that they removed both engines at the same time for their rebuild!! Might of saved $10k I was told. But stupid mistake ! Otherwise they’re of anchored on the back side of the island facing hurricane Lenny coming East out of the Gulf of Mexico. And she could still be here today!! Yes Brian was a jerk. I was the bartender. But the crew and times ere the best. We celebrated our 10th anniversary taking a cruise on this ship. Was sorry to hear she sank, but don’t see any sign that they’ve restarted their business with a new boat? Many great memories of that cruise; those islands are magical, and we have wonderful memories of where we went, our fellow passengers, and the crew. We dream of doing it again! spent the evening of my wedding on the SFD anchored in magens bay usvi. they sent a small boat to the beach to pick my husband,me and Brian the captains fiance (she photographed our weddingaa) up. It was the costume party night of their cruise and they were kind to invite us to dinner dancing and a fun round of Limbo. We had a great time and was sorry to hear of the ships demise.